MICHAEL CHAMPMAN-SAVAGE AMUSEMENT-VINYL EDITION-RECORD STORE DAY 2016. Nowadays, artists can spent years recording an album. They announce that they’re about to start work on their next album. That’s the last anyone hears of the artist for years. They’re locked away in their home studio, with only a DAW and a handful of plug-ins for company. What follows is a never-ending quest for perfection. Songs are recorded and rerecorded. Every minor imperfection is removed. Autotune in used on the vocal, drums are programmed and every minor imperfection is removed. Years later, when the artist has completed their “masterpiece,” they’re in for a shock. Often, music has moved on since they began recording their album. Their music is no longer is fashionable. If their music is still perceived as fashionable by critics, cultural commentators and tastemakers, then often the album is deemed soulless and over polished. Any soul the music ever had, has long been removed. As a result, the album sinks without trace. Not long after this, the artist is quietly dropped by their record company. When the artist is left to work out what went wrong, the root cause is the way music is recorded. Forty years ago, the only way to record an album, was in a recording studio. This cost money. So, artists were prepared. Songs were written and arranged. Artists and backing bands had practised the songs. They were organised, so when the tapes started rolling, they were ready to role. Often, classic albums were recorded in a matter of a few weeks, or a couple of months at most. Artists and their managers remembered the maxim “time is money.” That was the case in 1976, when Michael Chapman was about to release the eighth album of his career, Savage Amusement, which was recently reissued by Secret Records. That was quite a feat. Michael Chapman’s career began in 1969, when he released Rainmaker on the Harvest label. Since then, Michael had averaged an album a year. In 1970, Michael released the most successful album of his career, Fully Qualified Survivor. It reached number forty-five in Britain. The following year, 1971, Michael Michael released two albums. After the success of Fully Qualified Survivor, Michael was keen to build on the album’s success. So, he went into the studio, and recorded his third album, Window. It was the most controversial album of Michael’s career. After its release, Michael disowned Window, claiming it was an album of demos. However, the second album Michael released in 1971, Wrecked Again, was one of Michael’s finest albums. This proved to be a fitting way for Michael Chapman to leave Harvest. Next stop for Michael Chapman was Decca Records. After a gap of two years, Michael returned with the fifth album of his career, Millstone Grit. Released in 1973, this was Michael’s Decca debut. It was a return to form from Michael, who was maturing as a singer and songwriter. Maybe, Michael had found his home at Decca Records? Despite a busy touring schedule, Michael returned to the studio to record Deal Gone Down. It was released in 1974, and is one of the most underrated albums of Michael Chapman’s back-catalogue. Deal Gone Down is a showcase for Michael Chapman’s talent as a singer-songwriter, and his versatility. The thirty-three year old seemed to be maturing with every album. That was the case with Pleasures Of The Street. Released in 1975, Pleasures of the Street was Michael’s seventh album since 1969. Sadly, despite the quality of music on Pleasures of the Street, Michael was no nearer making a return to the chart. However, Michael Chapman was still a successful artist. While Michael was averaging an album a year, it was touring where Michael was making his money. This meant Michael had a tempestuous relationship with the recording studio. He realised the longer he spent recording an album, the more money he lost through not touring. Unlike many artists, Michael realised this early in his career. It was no epiphany. Instead, it was a realisation that “time was money.” So Michael worked quickly in the studio. He was always keen to get back on the road. So were his band. The road was their natural habitat. So, when Michael arrived at the studio he was always ready to role. This was the case when Michael began recording Savage Amusement. Michael had penned seven songs, Shuffleboat River Farewell, Secret Of The Locks, Crocky Hill Disaster, Lovin’ Dove, Stranger, It Didn’t Work Out and Devastation Hotel, Michael had chosen to cover Jimmie Rodgers’ Hobo’s Lament and Jimmy Reed’s How Can A Poor Man? These nine tracks were recorded at various studios, where Don Nix, formerly a member of the Stax Records’ house band, was tasked with reinventing Michael Chapman. The sessions didn’t get off to the best start. Don Nix, who was on medication, went to a party. Having enjoyed the party just a bit too much, Don fell of a roof. This didn’t please Michael. While Michael’s manager Max, tried to sort out this little local difficulty, there was already an atmosphere. Then Michael took a dislike to the Dolby noise reduction filters. Eventually, though, Michael and Don Nix, got to work on Savage Amusement. Recording of Savage Amusement took place at Sawmills Studios, Cornwall, Tapestry Studios, London and Ardent Studios, Memphis. Michael was a accompanied by members of his regular band, and a few guest artists. The rhythm section included drummer Keef Hartley, bassist Rick Kemp and guitarists Andrew Latimer and Tim Renwick. They were joined by keyboardist Peter Wood and Leo LeBlanc on pedal steel. Backing vocals came courtesy of Fuzzy, Mutt and Stevie. Michael Chapman played guitar and added vocals. Once Savage Amusement was completed, Michael and his band returned to the road. His eighth album, Savage Amusement was released in 1976. When critics heard Savage Amusement, they realised it was very different from Michael’s previous albums There was a reason for this. Many of Michael’s favourite guitarists came from Memphis. So, Michael wanted to make music where he could connect musically with them. This was Savage Amusement. However, that was all very well. What of Michael’s loyal fans? They were expecting something quite different? Maybe they, like the critics, would bewon over by the Michael Chapman heard on Savage Amusement? Opening Savage Amusement is Shuffleboat At River Farewell. Straight away, it’s obvious that Michael’s music is heading in a different direction. Slowly, the warmth of searing electric guitars and an elegiac piano combine. Then a roll of drums signals Michael and his band to combine blues and rock. Blistering guitars soar above the arrangement as the rhythm section provide the heartbeat, driving the arrangement urgently along. Flourishes and stabs of piano accompany Michael’s worldweary vocal. So, do gospel tinged harmonies. By then, everything is seamlessly falling into place as we hear a new side to Michael Chapman. There’s even a nod to Steve Harley and Cockney Rebel’s 1975 hit Come Up and See Me (Make Me Smile). Sadly, Michael never enjoyed the same success after his reinvention by producer Don Nix. He’s responsible to a new and captivating side of Michael Chapman that means you hungrily await the rest of Savage Amusement. Urgently, a slide guitar opens Secret of the Locks. Soon, guitars joins a moody bass and Michael’s vocal. It’s a mixture of anger, bitterness, frustration and sadness. Slowly, and deliberately he delivers the lyrics. Later, a blistering guitar and drums enter, helping frame Michael’s vocal. It’s now tinged with anger and cynicism. Especially when he delivers the lyrics: “you’ve made one mistake my love, that could have kept you free, you forgot to take your money, you’ll soon be back with me.” This clearly is one relationship that’s gone badly wrong. The tempo drops on Crocky Hill Disaster. It has a slow, spacious arrangement. A loping bass, hypnotic drums and chiming guitars set the scene for Michael’s vocal. He sounds not unlike Bob Dylan on Blood On The Tracks. His vocal is tinged with hope as he sings “but only the birds were singing, never heard them sing so sweet, I wanted them to sing for evermore” Then hope becomes joy as Michael sings: “and the sweetest, sweetest sight In ever saw, was my lady standing there.” These lyrics are among the finest on Savage Amusement, and are delivered with hope and joy by Micheal. Again, there’s a nod to Bob Dylan and Steve Harley and Cockney Rebel on Lovin’ Dove. This is another of the songs Michael penned. The rhythm section urgently drive the arrangement along. A piano adds drama and blistering guitar licks are unleashed. Then when Michael’s vocal enters, he sounds not unlike Bob Dylan. He’s accompanied by soaring gospel harmonies. They’re the perfect addition to this joyous, hook laden fusion of rock, gospel and soul. Hobo’s Meditation was penned by country legend Jimmie Rodgers. Accompanied by washes of pedal steel, Michael delivers drawling, half-spoken vocal, as he tells of living the life of a hobo. This means riding trains and roaming. After a minute, Michael delivers a thoughtful country-tinged vocal. Accompanied by an understated rhythm section and pedal steel, Michael’s vocal is thoughtful and pensive, as he wonders what the future holds for the hobo? How Can a Poor Man is another cover version. It was penned by Jimmy Reed. While its still retains its bluesy hue, Michael reworks the track. Searing, blistering licks are unleashes while a hypnotic rhythm accompanies Michael’s lived-in vocal. Subtle, cooing, sweeping harmonies are added. They’re the finishing touch to Michael’s reworking of an old blues. Ethereal harmonics, chiming guitars and a pounding bass open It Didn’t Work Out. Soon, drums and machine gun guitars are joined by keyboards. They provide the backdrop for Michael’s vocal. Again it’s reminiscent of Bob Dylan. Similarly, the arrangement is similar to those on Blood On The Tracks. Especially the way the soaring, cooing harmonies are deployed. Producer Don Nix seems to have the uncanny ability to drop instruments in where they belong. This result is one of the highlights of Savage Amusement, one where blues, folk, gospel and rock combine seamlessly. Closing Savage Amusement is Devastation Hotel. A guitar weaves its way across the arrangement, before washes of Hammond organ usher in Michael’s despairing vocal. Meanwhile, the rhythm section concentrate on providing the heartbeat. Gospel tinged harmonies are added. They’re yin to Michael’s yang on this tale of despair that closes Savage Amusement, a true hidden gem in Michael Chapman’s back-catalogue. Seven years after Michael Chapman released his debut album Rainmaker in 1969, he decided to reinvent himself. So, he enlisted the help of producer Don Nix, who formerly, had been a member of Stax Records’ house band. Don Nix was tasked with giving Michael’s music a Memphis makeover. So, recording of Savage Amusement took place in Cornwall, London and Memphis. Michael and his band recorded what was one of the best albums of Michael Chapman’s career. Savage Amusement was a fusion of blues, country, folk, folk rock, gospel, rock and soul. Almost seamlessly, musical genres and influences are fused over nine tracks. Among the influences are Bob Dylan’s 1975 classic album Blood On The Tracks and Steve Harley and Cockney Rebel’s 1975 album The Best Years of Our Lives. These two albums appear to have influenced Michael when writing and recording Savage Amusement. Sadly, Savage Amusement never enjoyed the same success as Blood On The Tracks nor The Best Years of Our Lives. Just like his previous album, Savage Amusement failed to chart on either side of the Atlantic. That was an opportunity lost. Stylistically, Savage Amusement could’ve broken Michael Chapman in the lucrative American market. However, that wasn’t to be. 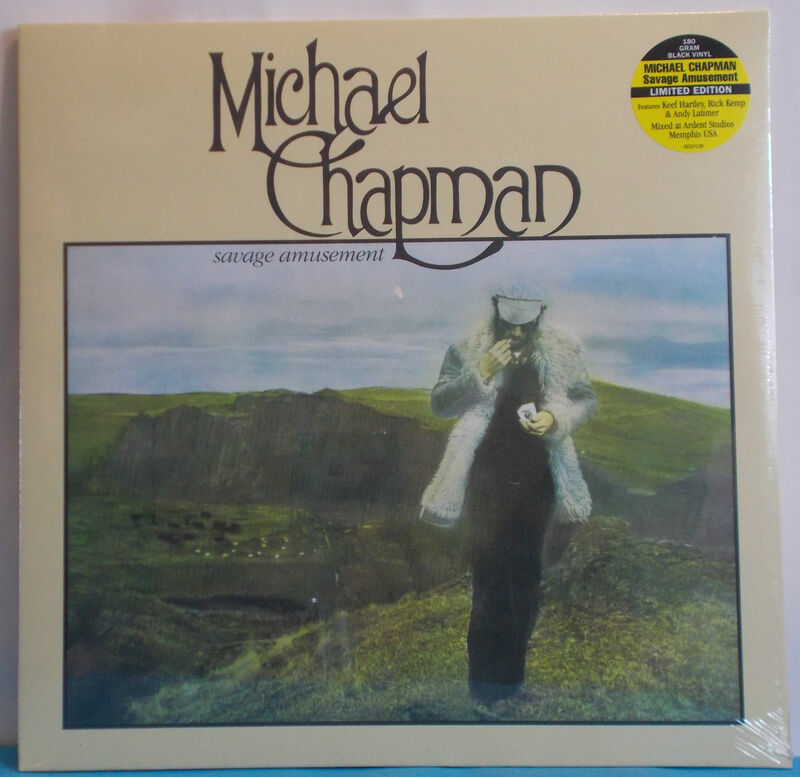 Maybe if Michael had been signed to another label then they would’ve gotten behind Savage Amusement?However, in 1976 Michael Chapman was signed to Decca. They seemed reluctant to go all out to back Savage Amusement. So, after being well received by critics, Savage Amusement sunk without trace. By then, Michael and his band were back on the road. For Michael, his fans had been divided by Savage Amusement. Some of his fans welcomed the change of sound, and realised that Savage Amusement was a lost classic. Others were shocked at Savage Amusement’s stylistic departure. They took some appeasing when touring Savage Amusement. Since then, Savage Amusement has continued to divide Michael Chapman’s loyal fans. For newcomers to Michael Chapman, Savage Amusement is a very accessible album. Although quite different from some of Michael’s previous albums, Savage Amusement oozes quality. From the opening bars of Shuffleboat River Farewell, right through to the closing notes of Devastation Hotel, Savage Amusement is a captivating album from one of British music’s best kept secrets, Michael Chapman. Not any more. Over the last few years, Michael Chapman’s albums have been reissued by various labels. However, one album was still to be reissued..,Savage Amusement. This was surprising, as it was one of the hidden gems of Michael Chapman’s back-catalogue. Thankfully, in 2o15, Secret Records decided to reissue Savage Amusement on CD during 2015. This was a welcome reissue, of an oft-overlooked album. Secret Records’ reissue was a lovingly curated reissue which restored the album to its formed glory. . Great care and attention had been taken with the mastering, which brought new life and meaning to the album. Still, though, a few purists bemoaned the lack of a vinyl reissue. Recently, this has been rectified. When the list of releases for Record Store Day 2016 was announced, Secret Records announced that Savage Amusement on vinyl. Not just any type of vinyl Instead, Savage Amusement was released on 180 gram black vinyl. This would please purists, given black vinyl’s supposed superior sound quality. Whether that’s the case or not, the reissue of Savage Amusement sounds stunning. It’s been beautifully mastered, and unlike so many albums released over the last few years, hasn’t fallen victim to the loudness wars. That would’ve been act of sacrilege. Thankfully, that hasn’t happened, Instead, Secret Records’ lovingly curated reissue of Savage Amusement will allow a new generations of music lovers to discover Michael Chapman’s lost classic. MICHAEL CHAMPMAN-SAVAGE AMUSEMENT-VINYL EDITION RECORD-STORE DAY 2016. ← NUGGETS-HALLUCINATIONS: PSYCHEDELIC POP NUGGETS FROM THE WEA VAULTS.